Life Deck Coating Installations in San Diego, Calif. Floor Seasons in Las Vegas, Nev. 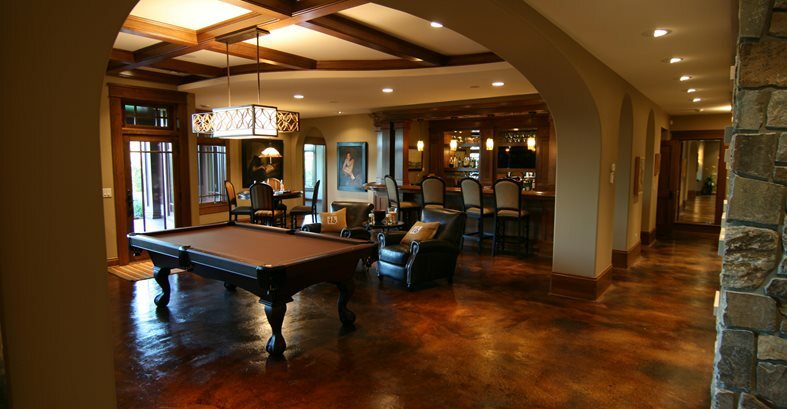 Concrete Arts in Hudson, Wis.
Staining is, by far, the most popular method for enhancing both commercial and residential concrete floors. Concrete stains are highly versatile, allowing you to achieve just about any look imaginable to suit your design tastes and budget. With stains, you have the ability to add subtle hints of color, bolder design accents, and even custom graphics. 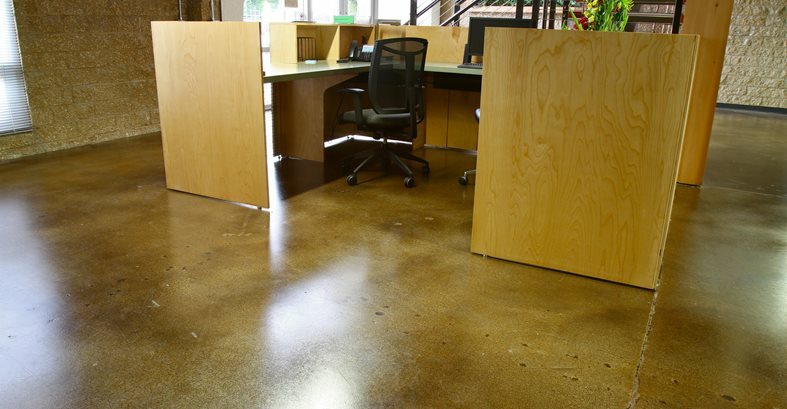 Stains can be applied to both new or existing concrete floors and work equally well with concrete overlays. What’s more, because concrete stains penetrate deeply into the concrete surface, they produce fade-resistant, permanent color. Unlike with a paint or coating, the color won't flake off or peel away. Depending on the look you want to achieve for your stained concrete floor, you can choose from acid-based chemical stains or water-based stains. Acid stains penetrate and react chemically with the concrete, creating natural color variations that add character and unique mottling effects, similar to the appearance of marble or granite. However, the color selection is generally limited to subtle earth tones, such as tans, browns, terra cottas, and soft blue-greens. If you want to go beyond the subtle drama and subdued color palette of acid staining, consider using water-based stains, which come in a full spectrum of hues. In many cases, the different colors can be mixed, like water-based paints, to broaden your options. There are endless decorative effects you can achieve when using acid or water-based stains. Sometimes the best approach is to keep it simple, using just one stain color in a hue that will complement your decor. Or you can be more daring and use multiple stain colors to create custom looks. Although shades of brown and gray are the most popular stain colors for concrete floors, don’t be afraid to try bolder shades, such as blue or black, to add more drama. Apply multiple colors of stain to mimic the look of natural marble (see Getting Concrete to Look Like Natural Marble). Apply water-based stains in bold colors to produce eye-catching graphic treatments (see Bowled Over by Color). 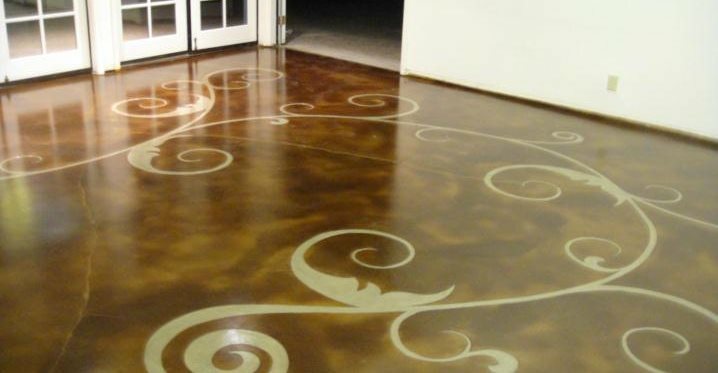 Keep in mind that although staining is a comparatively low-cost finish option for concrete floors, the final price tag of the project will increase if you want to use multiple stain colors, create custom graphics and faux finishes, or stain existing concrete that will need extensive cleaning and sealer removal.